Hardwood floor buffer - The floor buffer is the most important refinishing tool you will need to know how to use. A floor buffer can make a bad drum and edger job look good. Where as without it, not so much. The floor buffer can do the fine sanding a drum sander cannot. It can remove scratches from the drum. And blend in the edge and field for a more uniform scratch pattern. It is also, used for stain application, in-between coat abrasion, surface preparation and refinishing textured flooring such as hand scrapes, reclaim and wire brushed floors. 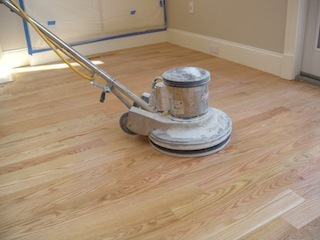 The floor buffer is a very versatile sanding equipment that you must know how to use. Hardwood Floor buffer: Clean up, before continuing on with refinishing hardwood floors. Any debris, that accidentally gets caught underneath the screen, of the buffer, can scratch or gouge your wood floor. Then, you will have to re-sand the area to remove the marks. You've done too much, and worked too hard, to have it ruined by a piece of debris. Let's spend some time to clean. 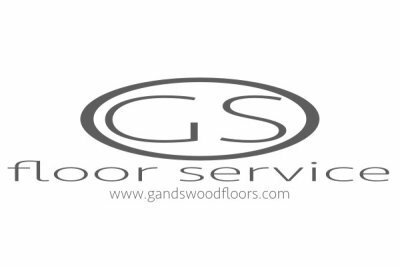 For newly sanded floor, you want to place a new 120 grit screen on the flooring, then, a white or red buffing pad over it, and then the floor buffer. Becareful, you can seriously injure yourself and others, with this hardwood floor refinishing equipment. Operating a floor buffer is just a balancing act. Keep the machine balance and it will remain where it is. You simply, shift the weight to direct the hardwood floor refinishing machine. Simple! Easier said, than done. Do not try and control this machine with just your two arms. Whether, it's a 2hp or 1.5hp, the machine will push you right into a wall or corner, resulting in serious injury. Remember, these are horsepower not human power. Begin by adjusting the handle to the proper operating height. To do this, release the lock, near the base, where the shaft meets the motor. Adjust the height of the handle to your waist or just below it, then lock it in place. When using a hardwood floor buffer, if you notice you are having a hard time shifting direction or controlling the hardwood floor refinishing equipment. Check the lock, to make sure, it's firmly locked in place. Starting from the middle of the room, away from windows, and anything that can break. Place the handle up to your waist. You want to lean your waist right on the handle. Don't be startled by this next part. When using a hardwood floor buffer, always keep two hands on the buffer control, at all times. Squeeze the trigger on the handle, there should be a safety button, along with the trigger, you'll need to push that, too. There will be a sudden jerk, push or the machine will take off, on you. Don't panic, just let go of the trigger, not the handle, the buffer will stop. Take a deep breathe and try it again. Just keep the handle on the waist area and balance the machine in place. The reason why, the machine took off, is because it was out of balance. How do we keep it in balance? Simply, center the weight of the motor to the base. As long as, you have the handle resting on your waist while using your body to counter weight. You can then, use your hands to shift the weight, by raising or lowering the handle, slightly. This will cause the floor buffer to either go left or right. You're moving the handle only by 1/4" up or down. Any more than that, the machine will take off on you. The buffing disc spins clockwise. Lifting the handle will cause it, to go right, and lowering it will make it go left, easy enough. When, you're buffing your hardwood floors, do a little practicing using the hardwood floor buffer on a sheet of plywood first. Until you get familiar with controlling it. 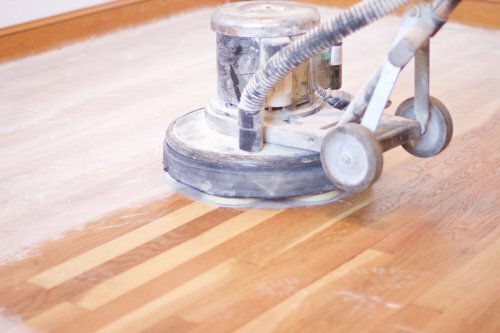 Buffing or screening is an important step on refinishing hardwood floors. Become good at it, you'll be using this flooring tool, throughout the rest of the project. You don't want to damage or put swirls in your wood floors, before the final coat. While the wood flooring is still bare, take the time to practice. Any wrong doing can still be fixed at this point. Besides, we need to wear down the screen, for later use. Screen the wood flooring, moving side to side, slowly, from one wall to the other. Overlapping your passes by half the diameter of the disc. Screen it lengthwise, then along the width That's it, you're done. Time to clean up. Sanding Tip - Make a final cut with 80 grit on the drum sander and floor edger. Then use a multi-disc driver to finish off your sanding. Complete your sanding with 100 and then 120 grit. Before applying your wood floor finishes. Then use multi-disc driver with 220 grit to sand in between coats. Now, we're ready to clean, vacuum, and tack our newly sanded hardwood floors. Click on the link to go to our Cleaning page. Or stay on this page and continue on reading. You can use a floor buffer, to do a light sanding pass, when you're refinishing hardwood floors. Leave all heavy sanding for drum sander and floor edger. Use floor buffer to abrade in between coats. This will ensure that you have a good bonding surface, for your new wood floor finish. This will also help remove any particles, drips, bubbles, brush marks or any imperfection, in your polyurethane wood floor finish. Need to re-coat your wood floors, after years of abuse. This hardwood floor refinishing tool will help you save money, by not having to hire a flooring contractor like myself, to do the job. Although, if you need help or would like to hire us, don't hesitate to contact us. Also, use a floor buffer to apply floor wax, for polishing, apply stain or just clean. Prevent pain in your shoulders, from those dreadful hand applications. So what are you waiting for? Go out and get a floor buffer, start refinishing your hardwood floors. Click the link to learn more about what the floor buffer can do, besides abrading a polyurethane finish. Click here to learn how to clean and tack your wood floors.